Call or email us at jimv@montanariveranglers.com to find out the current conditions on the rivers we fish. The Flathead River is on the rise again, but the guides are finding some success. At this point it is day to day depending on the weather. The river is high, but the color is pretty good with decent visibility. If we go a few days without rain up in the headwaters, the river fishes very well. A little rain causes the flows to increase and the fishing slows down. The Blackfoot River of southwest Montana is a freestone mountain river with spectacular scenery and clear, cold water. Fishing the pocket water in the large boulder runs, the swift riffles and the deep, clear pools is just plain fun fly fishing. Our Blackfoot river guides have the skill and the knowledge to get you within casting distance of some of the biggest fish I have seen caught on a dry fly. Montana's Blackfoot river holds some truly big Rainbow trout and Brown trout, as well as a good population of large Bull Trout. The only thing better than the Montana fly fishing on the Blackfoot river is the scenery. In addition to the beauty and bountiful fish, the Big Blackfoot River is very accessible, allowing you quick access to its remote setting and the feeling of a wilderness float. Your Blackfoot river flyfishing guide, Montana River Anglers, is all you need to get your dream fishing trip underway. 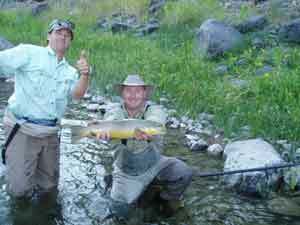 Montana River Anglers, Located in Whitefish Montana, provides guided fly fishing services on many rivers in Montana. Contact Us( 406.862.3448) to Book your Guided Fly Fishing trip Today.